Flowerbomb is an explosive floral bouquet. Unexpected. 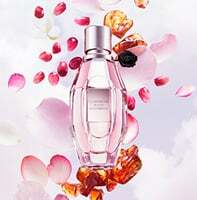 The essence of thousands of flowers gives rise to an ultra-feminine, delicious and sensual fragrance. A bouquet of tens of cattleyas, hundreds of sambac jasmine, thousands of freesia, and millions of rose petals enriched by an addictive scent of patchouli and vanilla. This now iconic fragrance was created by the perfumers Olivier Polge, Carlos Benaim and Domitille Berthier. Over ten years later, Viktor&Rolf infuse new life and spirit into the Flowerbomb story with a fresh image reflecting the fragrance’s modernity while respecting the visual continuity of the original. Featuring model Andreea Diaconu, the image was captured by Viktor&Rolf frequent photographic collaborators, Inez van Lamsweerde & Vinoodh Matadin. Flowerbomb is rated 4.8 out of 5 by 489. Rated 5 out of 5 by CATHYRENONV from FLOWERBOMB PARFUME SPRAY I opened a sample of this in IN STYLE magazine & initially thought that it was horrible----but I was wrong. After it dried down in a couple minutes it was simply wonderful! (I kept "re-sniffing" the sample & decided that I did like it after all.) I then bought my first bottle of Flowerbomb 3.4 oz. parfum. It is unlike ANY perfume I have worn before but I truly love it. Other perfumes I savor are Dolce & Gabana "ROSE THE ONE", & Gucci "FLORAL"---but this perfume is not at all similar to either of these. It has a character that is all its own & I enjoy wearing it. I have received many compliments too. FLOWERBOMB fragrance is unique & beautiful. Rated 5 out of 5 by Sah4l from Simply amazing! I went to the store during the Christmas holidays looking for something else and spotted the tester bottle for this fragrance while waiting on the salesperson to ring up my other purchases. Although the tester bottle was empty, I could still smell this scent. It was a light, subtle scent, yet powerful and lingering as well. It literally makes you feel as if though you are in the middle of a field of sweet, aromatic flowers!!! I get tons of compliments on it each time I wear it. Although it was a bit pricey, it was worth every penny. This scent is one that will be in my collection for as long as they continue to make it! Fantastic job and many kudos to the makers of this product!!! Rated 4 out of 5 by happy2craft from The smell changes over time I AM in love with this beautiful scent. I got all excited and bought the biggest bottle of this perfume. First year of using this, i get lots of compliments. AFTER a year, def not even close to finishing the bottle, the fragrance smell had change. Its now more like a strong manly smelling cologne. I thought it was me but i literally brought back the bottle to macys and compared new to use- DEF a big difference.I was very disappointed. I tried to givr it away to my sister, even she is not accepting it. :( only if i knew then, I would just buy small bottle enough to just last a year. Rated 5 out of 5 by Denise6859 from Great Fragrance! I originally smelled this fragrance in a spring catalog from another company. It smelled so good that every time I passed the magazine (or handled it) I made a mental note to purchase this fragrance. As a treat to myself last month, I purchased a bottle and the sample in the magazine does this no justice!! It smelled even better after I received it from Macys.com! I absolutely love it and it will be a staple in my collection. I have gotten several compliments and it remains on my clothes even after washing. This is a must-have!! Rated 5 out of 5 by classy4859 from Sexiest, most alluring fragrance ever I love, love, love this fragrance!! I get compliments every time I wear it and my husband absolutely adores it. I honestly don't know how anyone could give this fragrance anything less than 5 stars. Yes, it is a little expensive but it is a high quality perfume; a little goes a long way and it is worth every single penny. This is a warmer fragrance though, more sensual and alluring and not too sweet at all. Rated 5 out of 5 by LEEBONES from A Beautifully Feminine Scent I love this pefume more than any other that I have ever had before. To me, it does not have an overly flowery scent (which I do not like). Instead, it smells warm, softly feminine and elegant and I get compliments on it every time I wear it, which is all the time. It also lasts all day without any touch ups. It is my absolute favorite perfume and even though it may be more expensive than some of the others, to me, it is worth every scent.